"Listening" and "Broadcasting" (and "On the Short Waves, 1923-1945") reviewed by David Ricquish of the Radio Heritage Foundation (New Zealand). "Listening" and "Broadcasting" reviewed by Gerry Dexter in Popular Communications, April 2009. Reprinted with permission. "Listening" and "Broadcasting" reviewed by Andy Sennitt of Radio Netherlands Media Network. Also available at http://www.radionetherlands.nl/ ("Media"). Presented with permission. 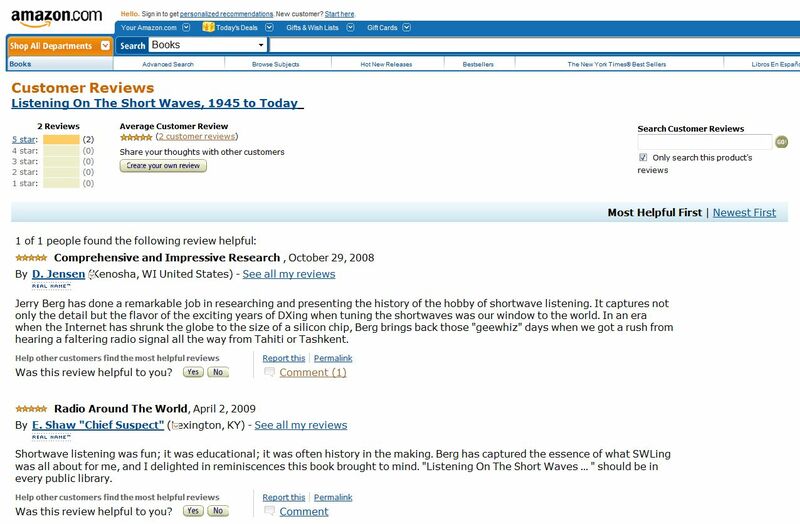 Comments on "Listening" by Don Jensen (October 29, 2008) and Ed Shaw (April 2, 2009) on Amazon.com. "Listening" and "Broadcasting" reviewed by David W. Kraeuter in the AWA Journal, quarterly bulletin of the Antique Wireless Association, Inc., April 2009. Presented with permission of the author and AWA. "Listening" and "Broadcasting" reviewed by Richard A. D'Angelo in the Journal of the North American Shortwave Association, January and February 2009. Presented with permission. Reviewed by Gayle Van Horn, Monitoring Times, February 2009. Presented with permission. Reviewed by Adrian M. Peterson, Coordinator for International Relations, Adventist World Radio, in "Wavescan," November 30, 2008. "Listening" and "Broadcasting" reviewed by Larry Magne for Passport to World Band Radio at www.passband.com (October 2008 and November 2008 updates). Reviewed by Steve Ford, WB8IMY, Editor, QST, January 2009. Reprinted with permission. Reviewed by Paul J. McClane, Editor, Radio World, November 19, 2008. Allen Graham of HCJB interviews Jerry Berg about his new books (as broadcast on "DX Partyline," November 29 and December 6, 2008). Keith Perron of "Happy Station" interviews Jerry Berg about his new books (as broadcast over WRMI on July 23 and August 13, 2009). Shortwave broadcasting originated in the 1920s, when stations used the new technology to increase their range in order to serve foreign audiences and reach parts of their own territory that could not easily be covered by regular AM stations. Experimentation began in the United States, but soon spread throughout the world. The discovery and development of shortwave technology during the 1920s and 1930s permitted radio stations throughout the world to transmit their programs over long distances, even worldwide, for the first time. The thrill of hearing broadcasts from faraway places produced a dedicated American audience. Developments in shortwave broadcasting and shortwave listening from their inception through the war years were covered in On the Short Waves, 1923-1945: Broadcast Listening in the Pioneer Days of Radio, published by McFarland in 1999. These new books pick up the story in 1945, describing the resumption of organized shortwave listening after the war and its development in the years since. Listening on the Short Waves, 1945 to Today, concentrates on the listeners. The companion volume, Broadcasting on the Short Waves, 1945 to Today, focuses on the world's shortwave stations. Written from the standpoint of the serious shortwave enthusiast, Listening on the Short Waves, 1945 to Today, begins with an examination of the broad shortwave audience. It then presents in detail the histories of the major North American shortwave clubs, and reviews the professional and listener-generated shortwave literature of the era. It also covers the DX programs and other listening fare to which shortwave listeners were most attracted, and the QSL-cards they sought as confirmation of their reception. The book presents a chronology of the shortwave receivers available to listeners, and discusses how changes in receiver technology impacted the listening experience. It also addresses the important role that computers have played in the shortwave listening of recent decades. Ch. 1 - Prelude to 1945: An introduction to the development of SWBCing through the war years. Ch. 2 - The Shortwave Audience: Who listens and why; SWLs vs. DXers; professional audience research; listener letters; early academic research on American SWLing, plus later studies; SWLs vs. hams; popularity polls; programming. Ch. 3 - Clubs: Detailed histories of the NNRC, ASWLC, NASWA, Canadian DX Club, CIDX, SPEEDX, ODXA, ADXR, ACE; also histories of the URDXC, ISWC, SWL International, Canadian SWL International, America Central Radio Club, International DXer's Club of San Diego, and others; ANARC and HAP; national, regional and local DX events; and foreign clubs in Australia, Denmark, New Zealand, Sri Lanka, Sweden, and the U.K. that have had an impact in the U.S.
Ch. 4 - Shortwave Literature Since WW II: Official sources such as FBIS, BBCM and the Berne lists; electronics magazines (Radio News, PE and others), monitoring magazines (DXing Horizons, S9, International Listener, Voices, MT, PopComm, International Radio, etc. ), and others; references like White's, WRTH, Passport, etc. ; shortwave books and monographs, band surveys, DX newsletters (including NU, FT, DXSF and many others), club publications, recordings, and DX humor. Ch. 5 - DX Programs and Listener Clubs: The history of the main DX programs, plus a review of other programs and station-run DX clubs. Ch. 6 - Receivers: A detailed historical review of the development of SW receivers since WW II--communications receivers, tabletops, portables, kits, etc., including receivers by Hallicrafters, Hammarlund, National, and other manufacturers past and present, with special attention to receivers that were intended for SWBC listening. Ch. 7 - QSLing: The verifiers and non-verifiers, station QSL policies, reporting techniques, QSL literature, DX statistics, awards and contests, country lists, SWL-card swapping, and WPE calls. Ch. 8 - Computers: Their impact, and that of the internet, on shortwave listening. Ch. 9 - Conclusion: Some ruminations on the future of SWBCing and SWLing. This book focuses on the stations and the environment in which they operated. It contains a detailed account of the shortwave bands for each year from 1945 to the present. Written from the standpoint of the listener, it reviews what American listeners were hearing on both the international and domestic shortwave bands, describes the arrivals and departures of stations, and recounts important shortwave events. It also introduces readers to the several categories of broadcasters, explains the impact of relay stations, frequency management, and jamming, and describes technologies with the potential to benefit and burden shortwave listening. It also addresses the changes in, and challenges to, shortwave broadcasting since the end of the cold war. Ch. 1 - Introduction to Shortwave Broadcastng: An historical overview of international, domestic, religious, clandestine, European and North American pirate broadcasting, plus private U.S. broadcasting; frequency allocation and management, power, relay stations, jamming (including the ISWC anti-jamming campaign), SSB, and DRM; and SWBCing in the post-Soviet era, including leased-time and the commoditization of shortwave. Ch. 2-8 - Shortwave Year-by-Year: The heart of the book is a detailed, year-by-year examination of the stations that were active on the SWBC bands--stations that came on (or left) the air, stations that North American DXers were hearing, special on-air SW events, etc. These chapters cover 1945 to 2008 and identify both the individual DX targets and the macro trends of this 60+ year period. Both international stations, and tropical band and other domestic shortwave broadcasting stations throughout the world, are covered. Ch. 9 - The Changing Shortwave Environment: A summary of the shortwave broadcasting scene since WW II; factors that have impacted audiences and broadcasters (other media, deregulation, etc.) both before and after the cold war; and the future, including DRM and BPL. Both books are 7x10" in size, and each includes a detailed index. For the benefit of those wishing to do additional reading or research, comprehensive endnotes and a selected bibliography contain extensive references to both popular and academic resources. The author, Jerry Berg has been active in shortwave radio circles for over 50 years as listener, editor and collector. He lives in Lexington, Massachusetts, and is the co-producer of ontheshortwaves.com.